I just stumbled across a new option on Society6 yesterday: throw pillows. And wouldn’t you know it, my couch is almost naked. I love Society6 and their products. The fact that most shops carry options to purchase designs in several mediums, including stretched canvas and iphone cases is really great. Not everyone wants something they can put on their wall. Silly kids. The idea of a painting or a photograph on a pillow greatly excites me and not ugly pillows are actually hard to find. I grabbed a few of my favorites last night, ones that I would actually consider putting on my couch. There’s an option to buy just the case and another to include the insert. If you do buy one then grab the pillow insert, it’s a really good deal. All of these ones also make me want to rehash some patterns I was working on last semester and getting those up in pillow form. Over the weekend I took a clearance tank I bought during the summer and managed to make a pillow out of it. Envelope pillow covers save my life when it comes to little sewing knowledge. My naked couch needs more pillows. 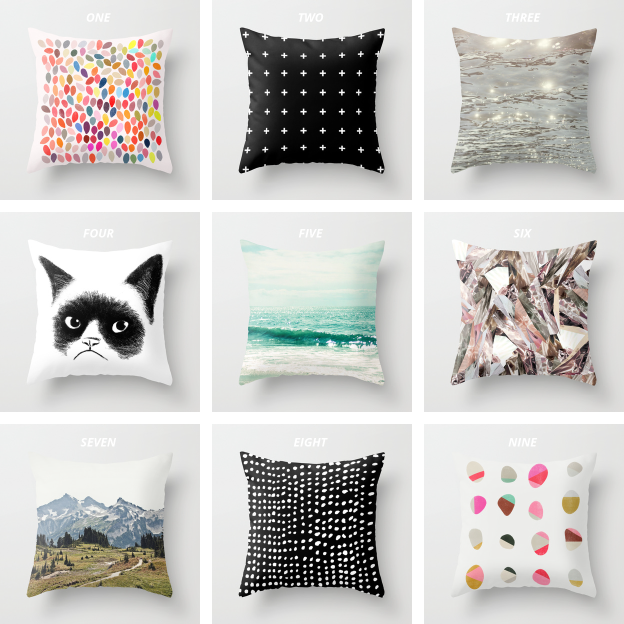 I’m definitely considering one of these Society6 ones but one could never have too many pillows.